If you live in an apartment or dorm, you might not think there’s much you can do to save energy, reduce waste, and conserve water. 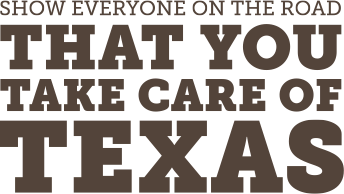 However, there are many ways that you can help Take Care of Texas from a rented home. Read on for tips on how to conserve while you rent. Even apartment-dwellers can save money and electricity by using their blinds and shades. Blocking out the sun in the summertime will keep your place cooler, while opening your blinds in the winter will allow the sun to come in and warm your home. Lighting accounts for about 12 percent of your annual energy bill. An ENERGY STAR bulb will use about 70 to 90 percent less energy than a traditional incandescent bulb. It will last 15 times longer and save about $55 in electricity costs over its lifetime. Maximize your washing machine’s efficiency and reduce water usage by only washing full loads of laundry. You’ll save up to 3,400 gallons of water annually. Save even more energy by using cold water instead of heated water. Composting can be done safely and cleanly in an indoor space. It keeps food scraps out of the landfill and provides you with nutrient-rich compost to feed plants. Visit the EPA’s website on how to create an indoor worm compost bin for more details. Recycled-content products are easily spotted by reading the labels on the packaging. One ton of recycled paper saves 17 trees and uses 50 percent less water. Remember to recycle any packaging and items you’ve purchased to complete the recycling circle. In the summer, keep your thermostat at 78 degrees or higher and use a fan to help keep cool. In the winter, reverse your ceiling fans to force the warm air down to the room below. The blades should be set on a low speed and spin in a clockwise direction. More than 78 billion pieces of junk mail are distributed each year. Most of this unwanted junk mail ends up in our landfills. By visiting the Consumer Credit Reporting Industry website and the Direct Marketing Association’s Mail Preference Service website, you can opt out of prescreened credit and insurance offers, as well as unsolicited commercial mail. Both secured sites are recommended by the Federal Trade Commission and will ask for personal information. If you do receive unwanted mail, it may be recyclable. A leaky faucet can waste up to 3,000 gallons of water per year–enough to take 180 showers. Read more about finding and fixing hidden leaks in your home.